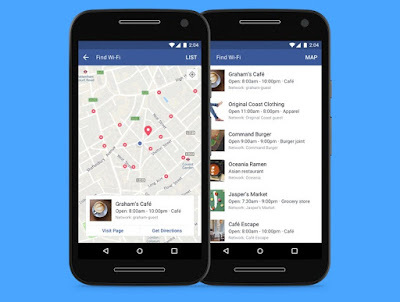 A year ago Facebook began testing another innovative function in its mobile applications that helps you detect where a free open Wi-Fi nearby is. cool innovation right? Today this has been developed and mature enough to roll out to all Facebook users on its Android and iOS applications. When you get the new function right into your application, you can go to the More tab and after that select Find Wi-Fi. After this point you may need to turn it on (just the first occasion when you utilize it). Once you've done that, you'll see a rundown or guide perspective of the nearest open Wi-Fi hotspots to your area or closeby. You can undoubtedly switch between the guide(map) and list view by the way. The list of places is populated with the names and points of interest of the organizations/business that run those Wi-Fi network, and you can quickly get location to any of them. There is only one issue here: to appear in the Find Wi-Fi area of Facebook, each business that has an open Wi-Fi organize should first claim it by editing its Facebook Page info. In this way, since this is simply opt in for business, it may take a while for Facebook's Find Wi-Fi to really have the greater part of the network that are out there.